Update (Feb. 2005). 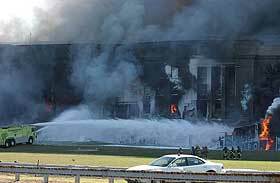 Brian, one of the firefighters at the Pentagon on 9/11, has put together a page called The September 11th Attack on the Pentagon. 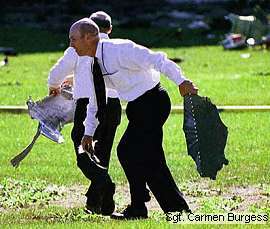 Update (Sept. 2002). 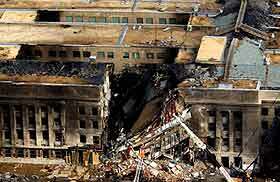 In his books, Thierry Meyssan claims that no plane crashed into the Pentagon on Sept. 11, 2001. After saying -- despite all evidence to the contrary -- that only the first ring of the building was hit, he now claims that the first three rings were damaged by a missile. He has yet to tell us what knocked down five light poles. If you want to learn more about them, please visit Spot the Lamp Poles. Thierry Meyssan of Réseau Voltaire, a French association close to far-left groups, wrote a book in which he claims no Boeing crashed into the Pentagon on September 11, 2001. Running in his father's footsteps, Raphaël Meyssan made a web page titled "Pentagon -- Hunt the Boeing! And test your perceptions!". Below, I have reproduced his seven questions, and answered them. Floors are numbered differently in different countries. In America, the ground floor is the first floor. In Britain and France, the floor above the ground floor is the first floor. In my answers, I have used the American numbering system. 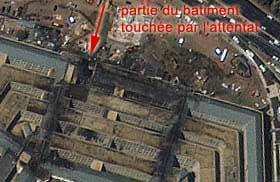 The first satellite image shows the section of the building that was hit by the Boeing. In the image below, the second ring of the building is also visible. It is clear that the aircraft only hit the first ring. The four interior rings remain intact. 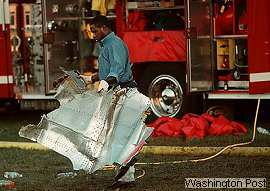 They were only fire-damaged after the initial explosion. Can you explain how a Boeing 757-200, weighing nearly 100 tons and travelling at a minimum speed of 250 miles an hour* only damaged the outside of the Pentagon? *250 mph when landing, 600 mph in flight. Exit hole where the plane stopped (Third ring). These two pictures only show that the roofs were intact. They do not show that the other rings were not hit. In the second picture, the first and second floors of the second ring are not visible although it is precisely this part of the outer ring that was hit. 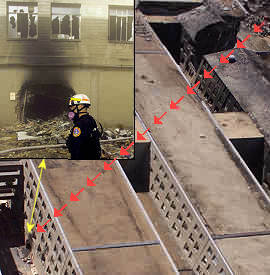 In Meyssan's second picture, we can see the collapsed part of the building. In the picture on the left, the back wall is undamaged (except for the hole), nothing sticks out of the windows, and there is not much soot. 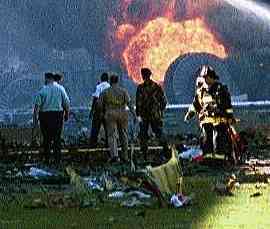 Hence, this is not the outer ring's back wall, and so the plane did not only hit the first ring. Eyewitnesses saw a hole in the wall of the second ring. 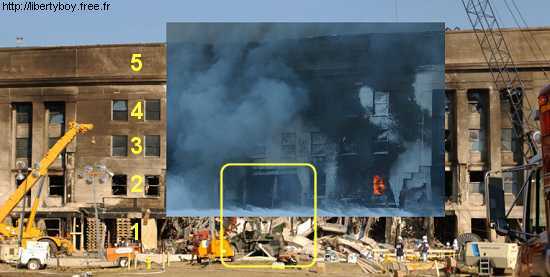 The two photographs in question 2 show the building just after the attack. We may observe that the aircraft only hit the ground floor. The four upper floors collapsed towards 10.10 am. The building is 26 yards high. Can you explain how a Boeing 14.9 yards high, 51.7 yards long, with a wingspan of 41.6 yards and a cockpit 3.8 yards high, could crash into just the ground floor of this building? Below is a section of the first picture pasted on a picture of the building. We clearly see that what Meyssan claims is the ground floor is actually the second floor. The building is five floors tall (the fifth floor does not have windows on the outer ring), and we can see three floors above the hole. Five minus three is two. 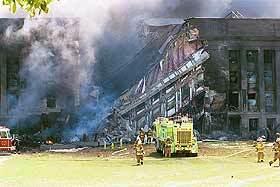 The photograph above shows the lawn in front of the damaged building. 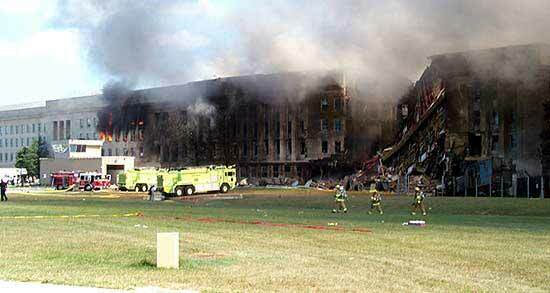 You'll remember that the aircraft only hit the ground floor of the Pentagon's first ring. 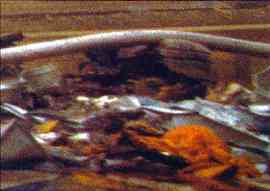 Can you find debris of a Boeing 757-200 in this photograph? Repeating endlessly that "the aircraft only hit the ground floor of the Pentagon's first ring" does not make it true. 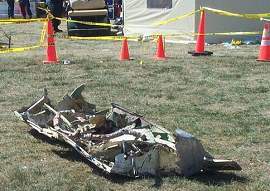 The plane did not hit only the ground floor (See Answer #2). As to the other rings not being damaged by the plane, it must be proven by showing that they were undamaged from the first floor to the fifth floor (See Answer #1). If you want to see debris, you just have to get a little closer.